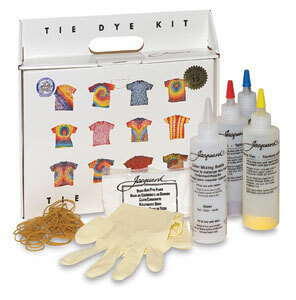 "We carry everything for the ceramic crafter"
Procion dyes are permanent, colorfast, and very washable. You can easily create a palette of brilliant colors ranging from light pastels to deep, vibrant hues. Fix with soda ash or sodium silicate. The sole purpose of sodium silicate in dyeing is to increase the pH. In using any sort of fiber reactive dyes to dye cotton or any other cellulose fiber, it is necessary to increase the pH (alkalinity) of the reaction. The high pH activates the cellulose fiber molecule so that it can attack the reactive dye molecule and form a permanent chemical bond to it. A similar mechanism allows the proteins in silk to react with fiber reactive dyes at high pH. The ideal pH for the reactive of cotton with Procion MX dyes is around 10.5 to 11, while that of Remazol dyes is about 11.5; the exact best pH depends on the dye and on the fiber being used. (See What is the effect of pH?.) The pH of your dye reaction does not have to be right at the ideal in order to work, but it should be near it, preferably within about one pH unit. The pH of a 40% sodium silicate solution is between 11 and 12.5. The high-pH chemical most commonly used in hand dyeing is soda ash, also known as sodium carbonate (see What is soda ash, and what's it for in dyeing?). If sodium silicate is used as a dye fixative, soda ash is not needed, since sodium silicate serves the same role as sodium carbonate. Sodium silicate is a substitute for soda ash or trisodium phosphate. Fabric that has been painted with Procion MX or similar dyes, and the dye allowed to dry, can be treated with a liquid sodium silicate solution. AfterFix is a solution of sodium silicate. "Just mix the dye powder with water, add thickener if you want - nothing else. Now paint it on. When it's dry, completely cover the dyed area with DyeHouse Afterfix (paint it on with a brush)....Keep damp, then one hour later wash out the Afterfix and excess dye and you are done! " They make a big point of not letting the sodium silicate dry on anything. Dry sodium silicate in your fabric is not something you want to deal with. "Using a wide soft brush or paint roller, apply PRO QuickFix to the right side (painted side) of your dry fabric. Use a minimum of brush strokes to avoid smearing your design. Let the PRO QuickFix dry a little bit, then cover your fabric with plastic/plastic wrap and let sit for 1 hour." Wrapping your silicate-coated painting in plastic wrap, as ProChem suggests, keeps it from drying out. They advise using a warm room temperature, over 70°F (21°C), for getting intense colors with sodium silicate. Just as with soda ash, a warmer dye reaction temperature works better than a cooler one. Poor results will result from a cold studio. Weigh your fabric. Use twenty times as much water as your fabric weighs: for 50 grams of fabric, use 1 liter of water, 50 milliliters of Tobasign brand liquid vinyl sulfone dye, and 50 grams of salt. Mix the water, dye, and salt, then add the pre-wetted fabric and agitate for half an hour. Remove the fabric from the dyebath, and stir in 50 milliliters, per liter of dyebath, of TobaFix brand sodium silicate solution (use half as much for silk). Return the fabric to the dyebath and stir it for one hour. Sodium silicate is purchased in the form of a thick liquid, dissolved in water at a concentration of around 40%. The traditional name for sodium silicate solution is water glass; it was once commonly used for preserving eggs at room temperature. You might be able to buy it from a small farm supplier. Look for a product called "Cement Floor Sealer and Carton Adhesive", checking the fine print on the label to be certain it is sodium silicate. Since sodium silicate is used in pottery making, you may be able to obtain it from a crafts supply store. The product "Engine Stopper" is the same sodium silicate solution, intended for use in destroying car engines. Sodium silicate is also sold by chemical suppliers, such as Ward's Scientific. 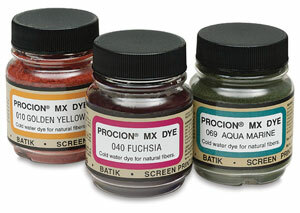 A drawback of using sodium silicate as a dye fixative is that acidic solutions can turn it into a gel that is extremely difficult to remove, so be sure to rinse well with alkaline or neutral water if at any step you are about to introduce a low pH (i.e., by using any acid, such as vinegar or citric acid). Do not leave the sodium silicate to dry on anything. Wash all spills immediately with water. After it has dried, sodium silicate cannot be removed. Don't use sodium silicate on or near a glass surface. Once it dries, sodium silicate cannot be removed from glass. Sodium silicate is severely irritating to the skin and eyes, and, like most household chemicals, must not be swallowed. It is not suitable for use by children. Wear reliable gloves, eye protection such as safety goggles, and a plastic or vinyl apron. J. T. Baker provides an MSDS for sodium silicate [PDF], as will any good supplier. When it dries, sodium silicate can form a glass film which is sharp enough to cut skin.